Heads up if you recently purchased a Graco Car seat. Graco is recalling 3.7 million car seats due to problems with buckles that may not unlatch properly. They are currently not recalling any infant car seats, but do check the list just in case to make sure yours isn’t one of the ones being recalled. The recall covers (11) toddler convertible car seats sold from 2009-2013 and includes Cozy Cline, ComfortSport, Classic Ride 50, My Ride 65, My Ride with Safety Surround, My Ride 70, Size4Me 70, Smart Seat, Nautilus, Nautilus Elite, and Argos 70. If your model does happen to be on the list, Graco will be offering a new and improved harness buckle at no extra cost. The company does want to stress this does not in any way affect the performance of the car seat or the effectiveness of the buckle to restrain the child. If yours is not performing properly and cleaning does not improve this, contact customer service at 800-345-4109 (Monday through Friday from 9 a.m.- 5 p.m.) or through email at consumerservices@gracobaby.com. 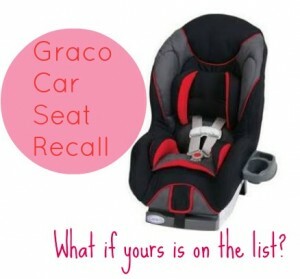 For more information about the recall, visit the Graco Recall page.